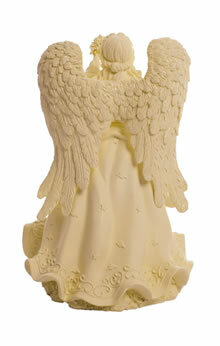 The Everlasting Love Angel Urn has the look of carved limestone but is actually made of high quality cold cast polystone. The intricately detailed angel is offering a bouquet of flowers, and her outstretched wings are accented with sparkling angel dust. A plate on the bottom of the urn can be easily removed for placement of the cremains. This urn is the perfect size for an infant or small child weight less than 40 pounds or a pet weighing less than 25 pounds. It can be also be used to keep a portion of an adult's cremains. Measures 8" x 11.5"H and holds approximately 52 cubic inches (about 3 cups).